Window damage due to foundation settlement in Hayward. At DBS, we address foundation settlement issues by installing foundation piers at key locations. The piers extend to stable, load-bearing soil, attached to the foundation with steel brackets. This repair work prevents further settling -- and can even allow the foundation to be jacked back to its original position. If you have a problem with your foundation, we can help. 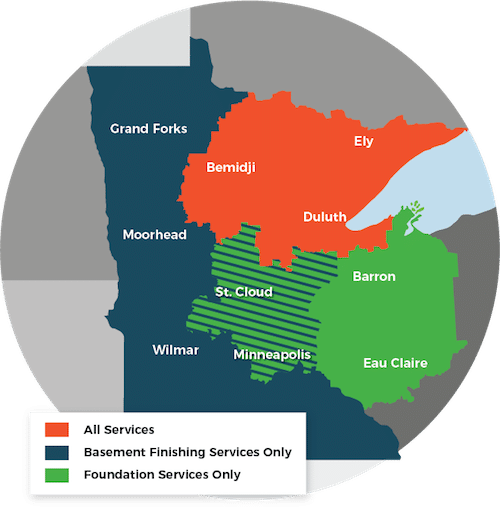 At DBS, we offer free, no-obligation foundation repair quotes within our Minnesota and Wisconsin service area. Each free quote includes an on-site inspection, personal consultation, and written estimate.